In 1883 Frederick Hinsdale Horsford and Cyrus G Pringle went into the nursery business together. As botanists they had traveled throughout North America collecting plants. 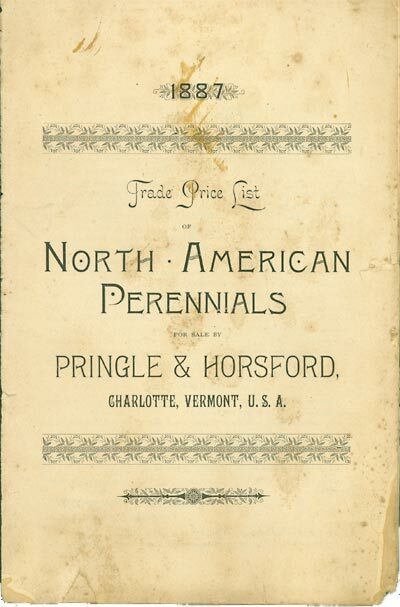 In 1893 Horsford bought out Pringle and created F. H. Horsford Nursery in Charlotte, Vermont. The nursery is still in existence on the same acreage. Horsford was an avid hybridizer and became known as an international pioneer in the hybridizing of lilies. Horsford offered nearly 60 varieties for sale in 1895. As the nursery business grew so did the selection of plants it offered to include trees, shrubs, perennials, vines, evergreens and roses. These were all grown from seed, divisions or rooted cuttings, started in a glass greenhouse and then lined out neatly in the perfectly maintained fields. Plants were dug at the appropriate time, barerooted, packed in crates and loaded onto a wagon. Crew often carted plants to the ferry and shipped them to gardens all over the world. By 1928 the state of Vermont listed nearly 40 nurseries doing business in the state with F.H. Horsford being the oldest and the largest. The next 80 years brought on many changes in the nursery business. Horse and wagons were replaced with gas-powered trucks, plants were dug and held in pots and sold over the course of the spring, summer and autumn. Slowly, mail order stopped and all business was done at the nursery. By the late 1970’s much of the plant material sold was bought in rather than grown on site. The once informative catalog was discontinued. In 1985 with the idea of returning the business to its glory days, Charlie Proutt and Eileen Schilling purchased the nursery. Hard work, long hours and great help from like-minded nurserymen and women enabled them to realize that vision. The nursery once again grows 90% of the plants they sell either from cuttings, seeds or root division. Two glass greenhouses are used for pesticide-free annual growing in the spring and plant propagation later in the season. Field-grown trees, shrubs and evergreens are sold at the nursery to local gardeners and landscapers. Extensive display gardens have been added, as has a garden gift shop. Neighboring land was purchased in the mid 1990’s, bringing the total acreage up to nearly 50. Horsford’s has worked hard to implement new-age, sustainable practices when it comes to water conservation, pest management, weed control, and use of cover crops at the nursery. The nursery employs many local team members who have degrees and valuable experience in horticulture. While many things have changed over the nursery’s 125 years, some things remain the same: a trip to Horsford Gardens and Nursery is a memorable experience, one worth repeating often. Click on an image to view as a larger gallery. Horsford’s 1932 catalog. Frederick Horsford would hand-paint the black and white photographs of nursery plants in color. An aerial view of the circle display gardens and Garden Center in fall 2018. An aerial view of tree and perennial growing areas in fall 2018.